For several days in a row in 1976, 28-year-old Kitty O’Neil strapped herself to a rocket and careened about the Mojave Desert at speeds reaching upwards of 600 miles per hour. The danger of that was nothing, however, compared to what she’s been through to get there. The half-Cherokee Kitty suffered through an enormous amount of adversity early in her life. She was deaf from the age of 5, having simultaneously contracted measles, mumps, and smallpox when she was 5 years old. She was an avid swimmer in her teens, but her promising diving career was hobbled by the onset of spinal meningitis, which threatened to take away the use of her legs. Then she had two bouts with cancer, all before she had turned 28. Her brushes with danger didn’t make her shy away from it, though — she went on to race drag boats, motorcycles, and sports cars, eventually ending up in Hollywood as a stuntwoman on productions such as Wonder Woman, Smokey and the Bandit, and The Bionic Woman. So when jet car builder Bill Fredrick approached her with a 3-wheeled vehicle powered by hydrogen peroxide and asked if she wanted to break land speed records, she said yes. 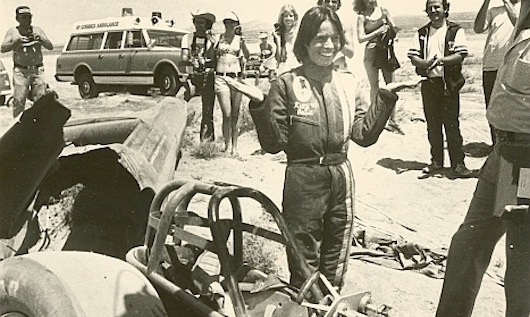 She handled the machine, titled the Motivator, with ease, and when she officially broke the speed record for womens’ racing (clocked by observers at 512 miles per hour, although others claimed she’d reached 618 in practice runs), she had only gone around 60% of the Motivator’s total limit. However, the race was shut down immediately thereafter by one of her movie directors, who was footing the bill. While he didn’t want to risk his star stuntwoman, he also ungraciously remarked that it would be “degrading” for her to break the men’s record too. Kitty continued her career for another six years before retiring. She often referred to her deafness as an asset — what would distract other stunt people would not affect her. She held 22 speed records on land and water when she retired in 1982. Her story was made into a TV movie starring Stockard Channing in 1979.